Launched in 2014, the Nexus 6 took the world by storm. Users simply loved the device and had a lot of fun exploring its features. It came with Android 5.0 Lollipop and not much later, that upgraded to Nougat. While many users are happy using the default ROM, we are sure you aren’t. You would like to upgrade the ROM according to your preferences and are wondering which one to go for. Well, the good news is that you have a plethora of options that you can check. What’s better is that we have listed some of the best options right here for you. Take a look! We cannot start a list about ROMs without the mention of Android Oreo. The latest update from Android, it has so many distinguished features that users are going crazy using their Android Oreo powered phones! From Google Play Protect to better battery life, autofill, multi-window option, picture-in-picture, and better connections, Oreo comes packed with it all. You can download it right here. Ask the current users, and they will vouch for Euphoria OS just like they vouch for Android Oreo. It is loaded with multiple great features including brightness control, USB OTG support, advanced reboot, and overall performance. With Euphoria OS you can enjoy upgrades or optimizations in kernel, security, navigation, sound, and many other categories. 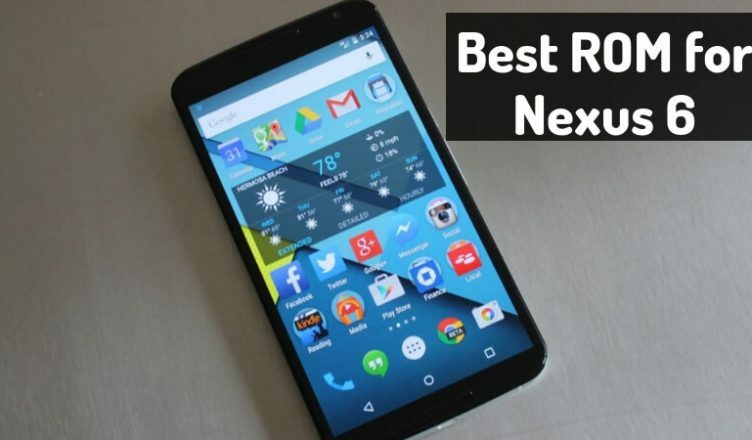 We highly recommend this custom ROM for your Nexus 6. Check it out here. Remember CM or CyanogenMod? That’s where Lineage OS comes from, and we have many happy users today. They swear by the operating system because it comes packed with multiple features. If you were disappointed before, Lineage OS is the redemption. Download now! Smooth and highly-customizable, the Resurrection Remix ROM is a favorite of many. It combines A-class features, power, and performance, making it a truly commanding option. It also has many add-ons that are sure to delight you! We must give special attention to its customizing ability because it is among the highest you can find. Users have a lot of fun checking out various options and tweaking them to suit their preferences. Thus, if customization is a priority for you, Resurrection Remix is definitely the way to go. You can download here. Viper OS is a new fish in the market but already has many great reviews. It has an AOSP code basis along with custom mods. It is almost like it brings the features of many other ROMs together to form one strong ROM. Battery and performance are its two USPs, and if this is what you are looking for, you should download Viper OS now. Developed by Meizu, Flyme OS offers performance optimization and one-handed usability among other things. Its notable flat design is very pleasing to the eye and for use. You can definitely upgrade your experience and enjoy a range of customizations with Flyme OS! SmartBar, Full Rootless Substratum Support, Pulse, Fling, and Status Bar Customization are some of the features you can enjoy with Dirty Unicorns. It may not be as popular as the others, but it is definitely worth giving a shot. Dirty Unicorns. Excited to explore the world of custom ROMs for Nexus 6? We can’t wait either! Download your favorite and share your experience with us. We are looking forward to it.